A Fall Arrest System could be as simple as a harness and 6’ lanyard up to an engineered Confined Space Entry System for tank inspection and anywhere in between. 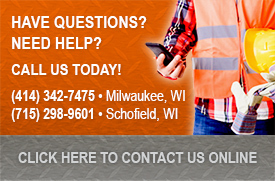 You’ll be happy to know that Wisconsin Lifting Specialists experienced customer service team and suppliers have you covered. We can have you stop by the store and try on anywhere from 15 plus different styles of harnesses, retracts and lanyards to find the right one. More complex, well our sales staff is ready to visit your site and application needs to help you obtain a safe and secure fall arrest system for you and your employees. Lifting and Rigging Products. All Rights Reserved.